There are 2 posts tagged kaizen (this is page 1 of 1). I’ve used a lot of drop shoulders on him because when somebody has higher seams, it somehow improves the posture and makes their look seem more put-together and tidy, which of course we didn’t want. [..] I know this all seems like a very subtle thing, but from a costume designer’s point of view it does make a difference. And if you make sure that you’re doing it the right way down to the basics, then you’re assured of getting the overall effect you want. 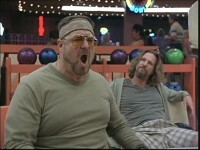 This shows the extraordinary high level of authorship of the Coen brothers. The quote made me realise that one of the reasons that this movie gets better every time I see it, is because every single element in the movie is put there by the directors for a purpose. Nothing is there by chance or by the fact that it was just there when they came around to shoot a scene. We all have had the experience of trying to turn on one of the burners on a stove and randomly trying out the knobs to see which one works. Donald Norman explains in The Psychology of Everyday Things the cause of this problem: the burners are arranged two by two and the knobs are in a single row of four. There is no natural mapping between the two. Why not? Because even though we all know the problem, there has never been a designer who has cared enough to think about a solution and implement it (i.e. if the knobs were arranged two by two then we would never make the mistake). Often aesthetic reasons get first priority. I keep a Twitter account, @unusablestuff, dedicated to documenting these design follies. This shows that he was able to take the tacit view of the user of his products. A view that the user might not even be able to verbalise themselves. Do you see yourself as an author in the sense that you are fully responsible for the experience that the learner has? Did you look at the end results with the eyes of the learner? Do you realise that the thing you create might be seen by thousands of pairs of eyes? Did you make a conscious design decision about every single part of your elearning module and does everything that is included have a clear purpose? Or did you just use things that were turned on by default or put in things because that is the way it is always done? Have people around you been talking about the Pareto principle (the 80/20 rule) and are you therefore delivering something that is mediocre? Do you like interacting with things that are mediocre? To summarise: Details matter, so please act like they do. P.S. I have just started reading On Writing Well. I intend to use the lessons in that book on this piece of writing. I am curious to see how much it can be improved! Arjen Vrielink and I write a monthly series titled: Parallax. We both agree on a title for the post and on some other arbitrary restrictions to induce our creative process. For this post we agreed to write about how Kaizen (the philosophy of continuous improvement) relates to the rise of the Good Enough paradigm. The post also has to include a non-digital example of Kaizen versus Good Enough. You can read Arjen’s post with the same title here. The world is full of badly designed things. I find this infuriating. A little bit of thought by the designer could make many things so much easier to use. My favourite book on this topic is The Design of Everyday Things by Donald Norman. It is years ago since I read the book, but I can still remember Norman agitating against all kind of design flaws: why would an object as simple as a door need a manual (“push”). I have therefore decided to start a new Twitter account titled unusablestuff in which I post pictures of things that fail to be usable. Kaizen is a daily activity, the purpose of which goes beyond simple productivity improvement. It is also a process that, when done correctly, humanizes the workplace, eliminates overly hard work [..], and teaches people how to perform experiments on their work using the scientific method and how to learn to spot and eliminate waste in business processes. I’d also like to see it as being a mindset. Another thing I recently read was a Wired article titled: The Good Enough Revolution: When Cheap and Simple is just Fine. The article is full of examples where cheap, convenient and fast wins out over high quality. Think netbooks, MP3 files and the Flip videocamera. Both ideas have their appeal to me, but at a superficial level they might seem to contradict each other. Why would you spend a lot of time trying to continually improve on something, when good enough is just good enough? This contradiction isn’t truly there. Good enough is essentially relevant at a higher level than Kaizen. Good enough means you design for a specific task, context, audience or zeitgeist and don’t add things that aren’t necessary. It is about simplicity and lowering the costs, but not about lowering the design effort. Kaizen is about the details: once you have decided to build a netbook (smaller screen, less processing power, but good enough for basic browsing on the net), you should still make sure to design it in such a way that people can use with a little waste as possible. Let’s look at garbage bins as an example. A garbage bin is a relatively simple product. It is a bin with a lid that can hold a bag in which you put the garbage. 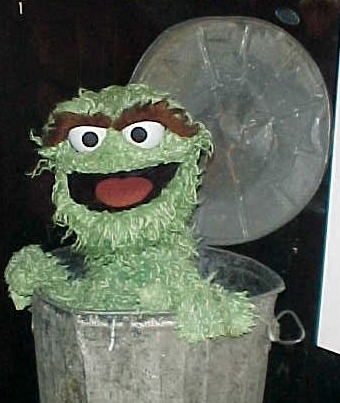 Oscar lives in one of the classic bins. In essence this is good enough. You don’t need auto-incinerators, sensors that tell you when the bag is full, odour protection, etc. The simple bin-lid-bag concept does have a couple of issues and problems that can be solved with good design. The Brabantia 30 liter Retro Bin is a bin that has done exactly this. What problems are solved with the design of this bin and how? Problem: Sometimes you need two hands to get your garbage in the bin. If you have to scrape some leftover peels from a cutting board for example. In that case you have no hands free to lift the lid of the bin. Solution: You create a bin with a foot-pedal. A foot-pedal also keeps you hands clean as you don’t have to touch the lid of the bin which is often dirty. Problem: When the bin is empty, pressing the pedal might make the bin move. Solution: A rubber ring at the bottom prevents the bin from moving on any flooring. Problem: It can be irritating to constantly have to press the pedal if you want to throw away multiple things and have to walk back and forth to get the garbage to throw in the bin. Solution: Hinge the lid in such a way that if it opens all the way it stays open. Allow this to be done by a persistent movement of the foot on the pedal. Problem: If the bag gets really full (by pressing down the garbage) it might press against the mechanism that is used to open the bin, making it hard to open. Solution: Make sure that the mechanism for opening the lid on the basis of the pedal movement lies completely outside of the bin and is unaffected by the pressure. Problem: When you put in a new bag it often happens that there is air trapped between the bag and the bin. This makes it hard to throw aways things as the full space of the bag is not used. Solution: Put little holes in the top of the bags. This allows the air to escape when putting in a new bag. Problem: There is often a vacuüm between the bag and the bin when you try to lift a full bag out. This gives you the feeling that the bag is stuck. Solution: Have little holes in bottom of the sides of the bin. This way air can come in, preventing the vacuüm. Brabantia rightly thought that holes at the side of a bin look a bit weird, so they have created an inner bin and outer bin. This also solves an aesthetic (if not design) problem: the top edge of the bag being shown. This top edge now hides between the inner and the outer bin. Problem: A lot of garbage has some liquid components. These liquids sometimes drip from the bottom of the bag. Solution: Create an extra strong bottom for the bag of an extra impenetrable plastic. Problem: When a bag is full it can be hard to tie it up. Solution: First make sure that the bag is slightly bigger than the bin. Once the bag is out of the bin, the garbage has more space to spread and the top of the bag will have more space to tie up. Next, have a built-in string that can be used to tie up the bag (also highly useful for lifting out the bag). Make sure that this string is long enough to make for an easy knot. I have had all these problems with garbage bins at some point, the Brabantia bin solves them all. Many people will probably consider me a whiner (there are bigger problems in the world, can’t you get over these minor garbage issues?) or a weirdo (garbage bins, honestly?) and both are probably true, but that doesn’t negate my point. Getting a product on the market requires that is designed. Now think about the extra design effort to create a bin that solves common bin problems. How many more man months for the Brabantia design than for the classic “Oscar bin”? Now imagine the small problems that a user of a classic garbage bin encounters and multiply them by all the garbage bin users in this world. Any idea how many times an hour something is spilled in this world because there is no pedal on the bin? People like to blame themselves (“I am so terribly clumsy”), I like to blame the designer. Why not just spend some extra design effort and get it right? I want to draw an analogy with the design of software. I think the believe in Kaizen is what makes Apple products stand out. 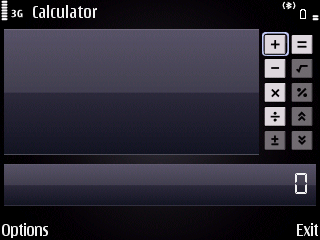 The example I love to show people is the difference in the calculator on the Symbian S60 3rd edition (I used it on the Nokia E71, my previous phone) and on the iPhone (my current phone). 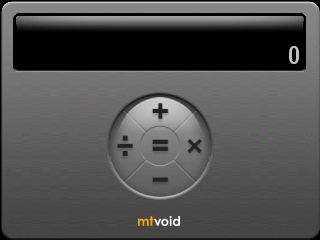 You need to use the keyboard (there are designated keys for the numbers) and the D-pad to make a calculation. The D-pad is necessary to navigate from one operator to the next. 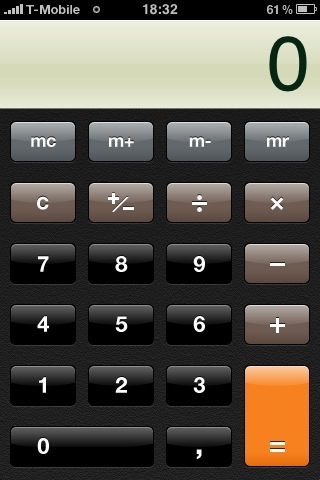 To do a simple calculation like 6 / 2 = 3 requires you to press eleven buttons! You just use your finger to tap the right numbers and operators. 6 / 2 = 3 only requires four finger taps. This calculator makes clever use of natural mapping to create a calculator that is as easy, if not easier, to use as Apple’s calculator. 6 / 2 = 3 takes indeed four button presses. Nokia could have made this. The fact that Nokia was willing to ship a phone with the default calculator as it was is one of the reasons why I have a hard time believing they have a bright future in the smartphone space. In a next post I might rant about how many designers think the whole world is right-handed. Do you have any thoughts on design?